UMIT is a strategic multidisciplinary initiative at Umeå University in computational science and engineering with strong industrial engagement. The research is to a large extent driven by industrial applications and focuses on simulation, visualization, computational methods and innovative software development, as well as research on associated computing infrastructures. UMIT was initiated in 2009 and has been developed in tight synergy with eSSENCE. Currently, four project leaders within UMIT are receiving eSSENCE funding, including two of the ten eSSENCE PIs. The research is performed in close industrial collaborations with companies such as Algoryx, Oryx, Valutec, LKAB, SKF, Limes, HAWC, SAP, D.A.S. Audio, and others. The research has led to establishment of new spin-off companies, e.g., Elastisys, and a substantial strengthening of Algoryx Simulations (19 employees, founded by UMIT members, working with Volvo, LKAB, Komatsu, ABB, Kongsberg, and Atlas Copco, to mention a few). In the following, we elaborate on how this research is performed in collaboration with LKAB and SKF. The collaboration with the iron ore producer LKAB focuses on modeling and simulation of large-scale granular matter with complex flows. 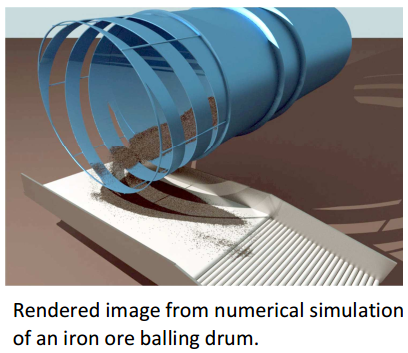 The main objective is to create models, numerical methods and algorithms for time efficient simulation of large-scale granular systems that in turn enable systematic studies of complex processes in mineral processing and ore pellet manufacturing. As common in UMIT-projects, the research follows the trinity model of Academia-SME-Industry, where the SMEs are Algoryx and Optimation. Algoryx develops simulation software tools partly based on research results from UMIT. Optimation applies the simulation tools for experimental analysis and development of more effective iron ore processing systems at LKAB plants. LKAB uses the simulation results for deeper understanding of the processes and for making decisions on how to modify the plants. The collaboration is formalized in several contracts that regulate IPR, disclosure of information, and obligations of the participants. The work is organized in a number of distinct well-define tasks ranging from research tasks involving a PhD student, VINNOVA projects and purely commercial projects. Project meetings are held on a regular basis with participation from all organizations and several research applications have been written jointly. The collaboration has strengthened the academic research at UMIT in several ways. Resources have been added to the environment by LKAB including 50% financing of a PhD student and a state-of-the-art HPC workstation. LKAB has initiated and organized a European network for simulation of granular matter and industrial applications which has led to new contacts with researchers in Barcelona and Edinburgh. LKAB has provided advanced measurement systems and experimental data from their (iron ore agglomeration) processes. These are used in validation tests and strengthen the scientific impact of the publications. Furthermore, the key results have been included in simulation software at Algoryx that gives UMIT-researchers a unique simulation tool with functionality and computational performance that would not be possible to develop in a purely academic environment. LKAB has gained a method and simulation tool with modules specialized to support research and development for improving the processing and transportation of iron ore materials. The tool has been involved in the development of new designs of balling drum outlets at LKAB. The simulations show that the new designs will lead to substantial increase in production capacity at the existing plants. The new outlets are planned for installation by the end of 2014. The simulation tool and visualization of granular matter flow has also increased the knowledge at LKAB about their systems including new ideas on how to improve them further. 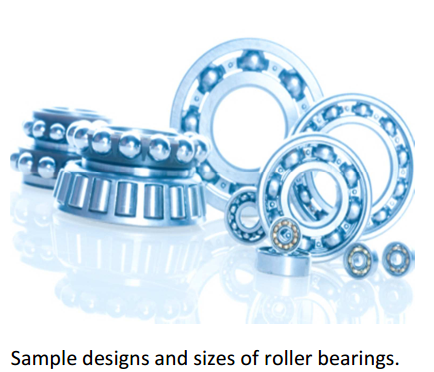 The simulation-collaboration also engages SKF in the development of improved roller bearings, which are widely used machine elements. The research is mainly focused on generation of cut finite element models (CutFEM) using a new technique that avoids the difficulties with traditional mesh generation, which is the critical bottleneck in the simulation pipeline; and reduction of finite element models. For the latter, low dimensional models suitable for use in dynamic simulations are developed. therefore not be used in a realistic time-dependent simulation. SKF provides partial funding for PhD students and Post Docs. There is a contract regulating, in particular, rights to results and rules for publishing. The collaboration includes regular meetings where tasks are defined for the research conducted at UMIT. The needs from SKF have led us into the two important and also currently very active research areas, CutFEM and model reduction, thereby enhancing research quality. In particular, the research in model reduction was motivated by and started in the collaboration with SKF. In the opposite direction, the collaboration has led to knowledge transfer from academia to SKF and also resulted in software that is used in SKFs in-house simulation tools. Further examples of industrial partnerships and research topics include: Valutec AB, Skellefteå – motivated research on topology optimization of metallic antennas; D.A.S., Valencia – new methods for the design of PA-speakers; Oryx Simulations and Algoryx Simulations, Umeå – methods for the design of heavy machine simulators for forestry, as well as, 3D-simulations for Offshore and CAD applications for customers like Kongsberg, ABB, Atlas, Volvo etc. Several of these examples demand efficient parallel algorithms and software for various infrastructure solutions, including HPC and cloud systems. software which make the UMIT collaboration quite unique. Such projects generally demand more resources than typically provided through a PhD candidate or a Post Doc. A main challenge is to secure long-term funding for this kind of activity and thereby make it possible to collaborate on a larger scale and create even more value for industry and society. The eSSENCE-related research has contributed to Engineering and Masters programs (teknisk datavetenskap, teknisk fysik och beräkningsteknik) at Umeå University (courses and Master thesis projects) and to national graduate schools NGSSC and SeSE. See also INT13 and INT14. During this period other large-scale external research funding includes Cloud Control (Swedish Research Council, framework grant 20 MSEK, in collaboration with Lund and ELLIIT), SIMOVATE (Vinnova, 10 MSEK), Cut finite elements, geometry and design optimization (SSF framework grant, 21 MSEK), and four EU FP7 projects (OPTIMIS, VISION Cloud, CACTOS, ORBIT in total exceeding 20 MSEK), regular VR grants of 20 MSEK, etc. A major part of this additional funding is a direct result of the synergies with the eSSENCE program. results, contributed to new and enhanced problem formulations, and supported more realistic evaluations. It has also had direct impact on the positive outcome of other project grant proposals and project reviews, as well as on educational programs. The strong industrial engagement has significantly contributed to the international visibility and appreciation of the research. The frontline basic research mainly funded by eSSENCE together with the industrial engagement often supported by other funding is highlighted in various reports and reviews of these other projects. People contributed to this Case Study description include Martin Berggren, Kenneth Bodin, Erik Elmroth (eSSENCE PI), Bo Kågström (eSSENCE PI), Mats Larson, and Martin Servin.